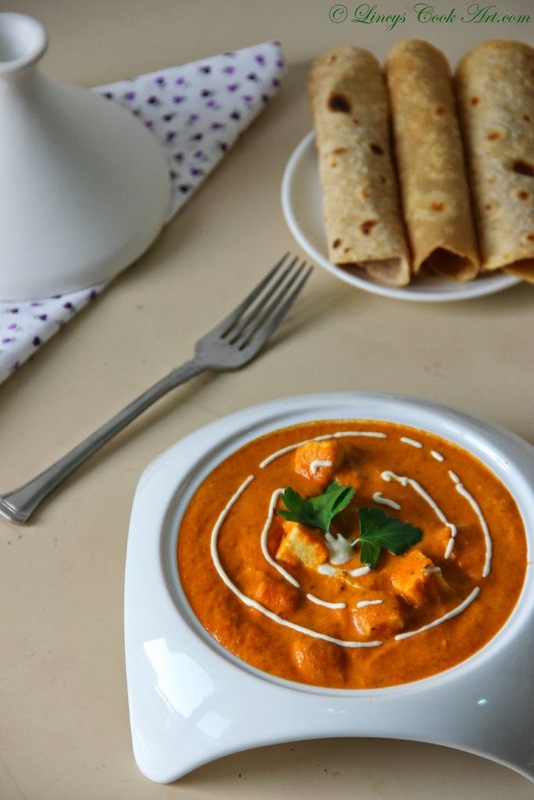 Paneer Butter Masala is a popular vegetarian delicacy from Indian cuisine. It is prepared in a tomato based creamy sauce with mild spices. This famous gravy dish originated from Punjab. Easy to make tasty gravy in minutes. Perfect side dish for Rotis and all types of Parathas. Heat a teaspoon of oil and a teaspoon of the butter in a pan. When the butter dissolves add onions cook till translucent. Now add the ginger garlic paste or finely chopped ginger and garlic. Sauté till raw smell leaves. Add the tomato and sauté for a minute and close the pan and cook till the tomatoes becomes soft and mushy. Set aside to cool this mixture. Grind this mixture as a fine paste in a blender. In a wide pan add a teaspoon of butter and add the onion tomato puree. Then add chilli powder, coriander powder, garam masala and salt. Add half a cup of water and cook in a medium high flame till the raw taste of chilli leaves. Now add the paneer and cook for a minute. Add Kasoori methi and allow the gravy to get the flavour a minute. At last add two teaspoons of cream and mixwell and swich off the gas. Garnish with chopped coriander and cream. Note: You can make this gravy more creamy by adding cashew nut paste in this recipe. You can use ginger garlic paste or chopped ginger and garlic in this recipe because it is finally going to be pureed. Raw onion and tomato can be pureed and can be used in this recipe (or) blanch the tomatoes in hot water and puree it and strained and can be used. Using cream is optional you can replace cream with milk. You can add extra butter for more rich taste. Drooling here.. yumm yumm.. Loved the presentation too..
love your bowls, so tempting gravy. Looking super tasty butter masala....... Love it !! tempting butter masala, love it!! !